We specialize in assisting buyers and sellers in Salt Lake County Utah. Our site contains ALL Utah listings from ALL Real Estate Agents including short sales and bank foreclosures. Search for your perfect home with our maps, virtual tours, new listing notices, price changes, and more. 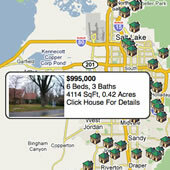 Customize your search by city, price range, home features, nearby schools, and lot size. Your FREE E-BOOK - Getting Your House Market Ready.